"So, Miguel? What did you do this summer?" I could tell you, but I'd rather show you. It's on TV starting tonight! I'm working as 2nd Assistant Director on a new TV series called "CRA$H & BURN". We've got three more weeks of filming to complete our first 13 episodes. But tonight - Wednesday Nov. 18 - at 9pm on SHOWCASE it's the SERIES PREMIERE! Gather your friends, loved ones, even your enemies and random hostages to watch the show. Then, once you're hooked, watch for a cameo by yours cruelly as the "Twisty Moustache Man" in episode #10. 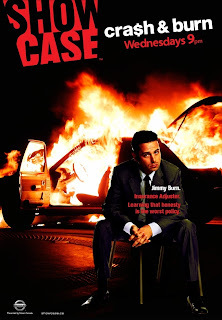 "Cra$h & Burn follows streetwise insurance adjuster Jimmy Burn as he navigates the gritty streets of Hamilton. He is squeezed between the cutthroat corporate culture that is big insurance, the con artists that make a living claim by claim and the city-wide infiltration of organized crime. Throughout the series, Jimmy must dodge shifty clients, crooked lawyers, backstabbing co-workers and the Russian mob as he fights to keep his job. All the while, fighting to make a life for himself and struggling to grab a piece of the middle-class dream – home, family and security. Cra$h & Burn is executive produced by Whizbang Films’ Paul Gross and Frank Siracusa, and also Malcolm MacRury (ZOS: Zone of Separation, Deadwood). MacRury also serves as the series creator and showrunner. The series stars Luke Kirby (Tell Me You Love Me; Slings and Arrows) as Jimmy Burn, the cocky yet charming up-and-comer looking to claim a slice of the corporate pie as an insurance adjuster." I'm all for promoting grassroots events, like indie film festivals and zombie walks, etc. If it weren't for these events many creative folks would never get their starts, developing their style in the crucible of popular opinion. And audiences would miss a chance to see something different, created by individuals rather than by consensus committees. 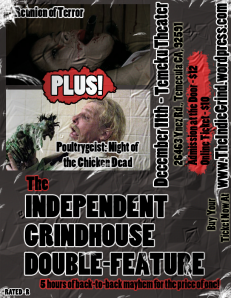 I heard about The Independent Grindhouse Double Feature thanks to an e-mail from organizer Matthew Castro. The formula for this recurring festival is to pair something new with something known in order to attract a crowd and introduce it to the new thing. In this case the known thing is Troma's "Poultrygeist: Night of the Chicken Dead", directed by Lloyd Kaufman - which I reviewed last year when it screened at the Toronto After Dark Film Festival. And the new thing is the premiere of the feature film "Reunion of Terror" from director Michael Hoffman. The director, cast & crew of "Reunion of Terror" will be in attendance for a Q&A. Also part of this devilish double bill are trailers, a short film, and contests with prizes. I love prizes. All in all it should be a freakishly good time. Take a date and some KFC and dig into the Independent Grindhouse Double Feature. Tickets available at the door for $12, or on-line in advance for $10. Purchasing your ticket online grants you a chance to win a FREE Indie Grind T-Shirt! After Halloween there's one last chance to scream! 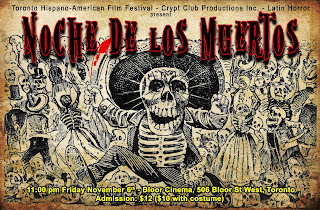 Crypt Club Productions Inc and Latin Horror proudly announce the film line up for their co-presentation of the inaugural “Noche de los Muertos” event at the 12th Toronto Hispano-American Film Festival. "Noche de los Muertos" is a special, creepy late night showcase screening of the best Spanish / Latin American independent horror films. Don’t miss this one time screening. TICKETS: $12 regular or $10 with scary costume. PLACE: Bloor Cinema 506 Bloor Street West (Bathurst Subway Station), Toronto.